The latest version of Corel PDF Fusion brings a complete PDF conversion and creation with one-click conversion from and it allows you to work with over 100 different file formats even if you don’t have the software used to create the file! Open PDFs, graphics, Microsoft Office formats, photos and many more . Corel PDF Fusion lets you quickly and easily create high-quality PDF files from more than 100 file types, and all the PDFs you create are 100% compatible with all PDF viewers, including Adobe Acrobat and Adobe Reader. One of the best things about Corel PDF Fusion is that, the user can import files to it even if the applications that have been used to create those files are not installed in the computer. Building DOC, XPS and PDF files become a lot easier with the Corel PDF Fusion. The software can put together files from more than a hundred formats to create secure documents, without losing any data. With Corel PDF Fusion, the user can easily share, edit and secure. The user can limit the viewing of the contents to a few chosen people; he may even secure some documents for his eyes only if he chooses.. The trial period provided by Corel should be able to provide the user enough perspective about how the product really works. With PDF Fusion new features which you can import any of more than a hundred file formats and use those files to create PDF, DOC and XPS documents. It helps that the software enables the user to put together various files even if the applications used to create those files are not installed in the computer being used. Even if the file format is changed through saving, the formatting and layout is maintained. Hyperlinks and bookmarks may also be added, either for building a new file or for recreating the file as it was in its original format. The user may also decide to restrict the viewing of the contents of the PDF files to a few people. He can go through multiple files because of the software’s batch conversion capability. 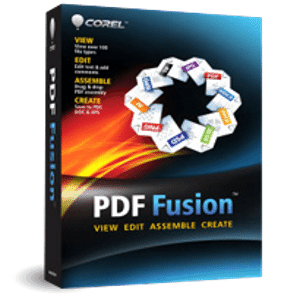 Corel PDF Fusion may be considered mid-priced for its kind. Quick and smaller software for working with PDF are a little cheaper while professional grade ones cost more. Corel PDF Fusion can be used professionally and covers a lot of ground, what with it being able to support more than a hundred file formats. If the user is serious about working with PDF files, not losing information after a change in file format and securing current and archived works then he definitely needs the Corel PDF Fusion. The software also offers ease of use through its easy to understand and manipulate user interface..
Corel PDF Fusion may be considered mid-priced for its kind. Quick and smaller software for working with PDF are a little cheaper while professional grade ones cost more.